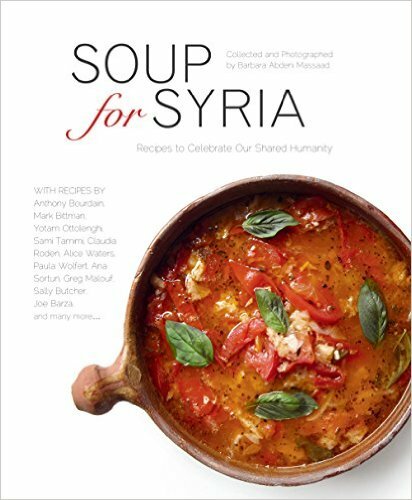 This cookbook is Soup for Syria, and it martials the cooking expertise of dozens of celebrity chefs to raise funds for food aid. Certainly, one of the most important steps Westerners can take in addressing the food crisis among Syrian refugees is to open not just hearts, nor even pocketbooks, but borders. Millions of Syrians haven’t just been forced from their homes by criminal attacks and left to wander the wide world. They’ve been further locked into a few neighboring countries that are now struggling with the influx in population. But in an absence of humane policy, or an international agreement on justice, many small and large organizations are raising funds to help Syrian refugees, including a number of authors and publishers. In 2012, novelist Samar Yazbek started the Women Now organization, which works in Syria and surrounding countries. Children’s book authors and publishers like Fatima Sharafeddine, Gulnar Hajo, Samer al-Kadri, and Nadine Kaadan have started libraries, drawn murals, donated books, and done readings in the camps. And now, publisher Michel Moushabeck and chef-activist Barbara Abdeni Massaad have combined forces to bring out a cookbook to raise funds for food aid. Moushabeck convinced Abdeni Massaad that they could take the project further with a roster of celebrity chefs and plans to co-editions in other countries, in other languages, with other celebrity chefs. The cookbook also features photos taken by Abdeni Massaad. However, it’s important to note that other co-publishers aren’t held to the same arrangement. Pavilion, the cookbook’s UK partner, will donate just a portion of their proceeds — a “a minimum of £2,” according to The Guardian. And these funds will go not to UNHCR, but to UNICEF UK. Hondurans, Listen to the Children!